See also Cribrilaria, which can be considered as a subgenus of Puellina. After the revision by Rosso et al. 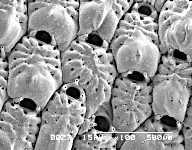 (2018), the status of Cribrilaria and Glabrilaria (and also Puellina) have been raised from subgenera to genera. Several species have been reassigned. Making consequential changes in WoRMS will take a little time, but this is in progress. Puellina (Puellina)? 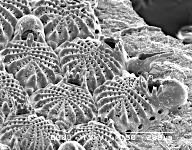 catena at Neogene Bryozoa of Britain.